Thank you, Nerdy. Words cannot express how grateful I am for this place and all those that come here. I miss my President. Every day. It’s good to see you isonprize. I wish it wouldn’t have to be under such devastating circumstances. Hey ison. So good to see you. Meta has the best thread on twitter. I miss President Obama too, so much. Ison, great to see you! Several TODr’s are coming to Philly for Michelle’s book tour; we’ll be getting together for dinner on either Friday, Nov 30th or Saturday, Dec 1st. Contact me at ruley dot veterans at gmail dot com for details. Hope you can join us. You speak the words in my heart, too, ison. Bless. isonprize, we need all of us. So glad to see you here again. This is the time when we need this community. I am so thankful for all who are here. Thank you Nerdy and Meta for all you do. I went to a Nafshenu Stand Together Against Hate: SJ Community interfaith Vigil for Tree of Life hosted by the Camden County Government this evening. one more week ….. my plea to people of empathy in every part of the US is: please, come through at the ballot box …..
Yep, that’s why I quit facebook, its the same old thing. I love my friends and family, but I’m not overly interested in their thoughts on anything. Ha. Always stay true to yourself, Don! There should be more truth tellers like you, around!!!! This is not sounding good. I’m going to pray for them tonight. Unfortunately, when people are not treated humanely, people get hurt. Clarification: 2nd migrant caravan from Honduras is actually 3,000 people. They made it on a bridge after violent confrontation w/ Guatemalan police. Mexican police waiting for them on other side. The far right party wins in Brazil. What is going on? Inbox: President Obama to Campaign For Nelson, Gillum, Florida Democrats on November 2. Thank you Nerdy for keeping this wonderful place open. I don’t comment often any more, but read every day. I find that the wonderful people here usually express what I am thinking and feeling. One political note, here in Oklahoma we have a governor’s race. I am hopeful that Drew Edmondson, the Democrat will win. He is compassionate and knowledgeable. The other candidate is a cheater and habitual conman, in the mold of you know who. For a long time the polls were definitely Republican. Now, we are rated as a tossup. That is encouraging. Kevin Stitt, the Republican was against the education bill and teacher raises, said he would not have signed the bill. His only ads are screaming that Edmondson supported Hillary and is in line with Nancy Pelosi. Nothing positive at all…he has no plans, no understanding of government. Another failed businessman who thinks he knows everything. Bill Kristol helped bring about this disease by making John McCain select Sarah Palin who started a lot of the vitriol of questioning PBO’s patriotism. Now this same vitriol has visited HIS people. But this wishful thinking overlooks the central fact about Donald Trump’s approach to politics: His grip on power depends entirely on splitting the nation in two. Angry division — rooted in race, gender, immigration-status, religion and ideology — allowed Trump to become president. Absent a politics of us-versus-them, Trumpism makes no sense at all. This explains why Trump, after a rote declaration Wednesday that “we have to unify,” quickly resumed his patented attacks on the media. Absent a politics of us-versus-them, Trumpism makes no sense at all. it is undeniable that #Trump–with the acquiescence and, too often, the support of his party–has heightened ethnic and racial conflict for his own political benefit. Election Day in 8 days,….#WeThePeople have to SHOW Up and Show OUT!…This is NOT a Drill!! Folks often ask me how I stay hopeful and keep going. I'm hopeful because I'm living proof that the struggles of previous generations were not in vain. The only reason I'm not enslaved as my ancestors were is b/c they fought for our freedom. And that's also why I keep going. Hello the Dicktraitor openly allows China and Russia to listen in on his personal phone calls. Speculate for a moment how his little mind views this. Is he following orders? Does he think it makes him look LESS treasonous if he’s not picking the phone to talk to Russia and China directly? What is the threat from the Kremlin if he doesn’t let them listen in? This isn’t tiddlywinks. wtf is he doing? Normalizing it. How are we in this position? Hypnosis? Lookit..this is front page news happening every single day. Half of America needs to go back to Kindergarten. Just be kind. Treat people like you want to be treated. Don't cheat. Don't lie. Don't steal. Don't hit. Admit when you are wrong and say sorry. And don't eat the glue. The most intellectually robotic Democratic strategists—who invariably choose to play it safe rather than to try for the wins that might transform our politics—keep looking for ways to write off Texas US Senate candidate Beto O’Rourke as a Lone Star dream that could never come true. The same goes for the pundits who can’t see beyond fading calculations or snapshot polls. Because O’Rourke is running in Texas, a state where Democrats have been on a losing streak for the better part of a quarter-century, the naysayers just aren’t buying the prospect that an unapologetically progressive candidate could upend the reelection run of so wily and well-connected a Republican incumbent as Senator Ted Cruz. By traditional political measures, that’s understandable. If you are looking for easy and predictable wins, Texas is not going to rank high on any Democratic list. This is a state where Democrats have not won a Senate contest since Lloyd Bentsen was on the ballot in 1988. Yet O’Rourke heads into the final 10 days of the campaign with more money on hand than Cruz, and something rare for a Texas Democrat: the ability to hold his own in the many, many media markets of a large and politically expensive state. The real thief is the orange racist lying bafoon in the White House who would not be President if it was not for Russia and Voter Suppression. That racist bigot will never change, regardless how many people are murder or how many pipe bombs are sent to Democrats. Oh Trump is the effing THIEF…conspiring to sell America’s standing in the world to the highest bidder/despot. An American permanent resident with two children citizens is butchered by Saudi agents, and Trump shows us yet again the only thing that counts is his little me $elf. (Saudi Arabia “a great ally to me”.) Main comment – the incident was the ‘worst cover up’ ever like it was a mob reality show. So fervently has he kissed the line up of despotic arses: Jong Un’s arse: canceled U.S.A. military exercise with S. Korea and got zero in return while they went on w/their nuclear agenda. Putin Rosneft’s arse, or make me king of Little Russia. Now al Saud’s, bin Salman’s murderous arses. Tell me one saving grace, pls just one. Come on, GA! This amazing woman will be a great Governor for all! Being a Georgian is about more than language or background – it’s about our heart, our soul. It’s about believing that all of us are Georgia. So what kind of name do the racist lying orange bafoon want to call Stacey Abrams? Today, @LawyersComm attorneys representing @NAACPGeorgia and other groups are having a hearing about its emergency motion for a preliminary injunction on the GA exact match citizenship verification issue. My millennial kids know they would be in a crap ton of trouble if they didn’t vote! It is a right and a responsibility. Mr. Gillum please STEAL the election big time on behalf of America’s democracy. You are so vastly talented. Thanks for being here with us. Dear god. Trump’s tweet above endorses Bolsanaro who is also in favor of torture and white nationalism. = Another far-right authoritarian for little baby russian Trump to lean on. Another neo-fascist arse for him to kiss. I’m starting to think that this numbnut wasn’t working alone. I read he had a list with a couple hundred names on it. I’m almost to the point wherein I only go to two or three websites, and this is one of them. The level of pure unadulterated stupidity is at an all-time high. I come here, ESPN, and one other website. I can no longer stomach the craziness. Maybe Trump and his handlers have decided that his pre-election destruction is mostly done. All he’s to do now is sit on the gold-pated toilet and fire off accusatory misinformed (the Dodger’s coach and pitcher misunderstanding) tweets; call African American (D) candidates “thieves”; and continue building his global despot club. Oh and keep up on his Incite-To-Violence rallies. -All pretense at being president – not that he ever was – is 950% OVER. -Time to drag Trump off his perch. I hear ya, Don. Basically TOD and Twitter are my ownly news sources lately except for weather. I can’t stomach the rest. Brings tears to my eyes. 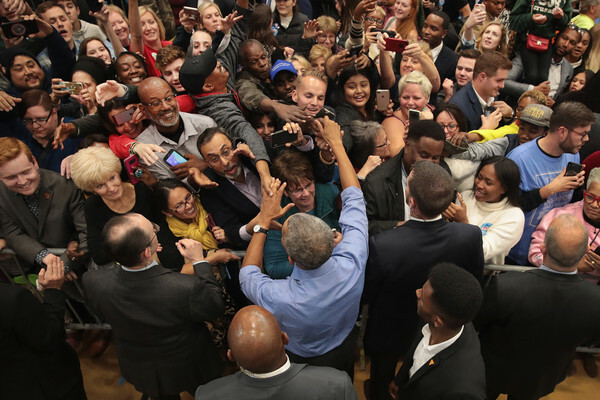 President Obama brings out the best in people. I hope the Parkland kids have mobilized young people their age to get out and vote. I pray for a blue avalanche to bury the re-pukes. 😉 😉 I suppose *you* already went to ‘Learn more’? I will be in line for tix for sure. Don’t even care who’s coming with me. I trust that FL-Governor-To-Be, and current Mayor Andrew Gillum will be able to handle that scumbag-in-chief who just insulted him, again. I personally wish that the Traitor-in-Chief’s comments would be ignored by the FL-Governor-To-Be, …. well until the victory speech on Nov 6th …. but that is just me and I trust the candidate to make the best decision. It's a mistake to look at Trump's actions in isolation. You MUST look at the whole. Trump designates migrants as the enemy. As criminals and terrorists and a threat to national security. He then directly threatens military force and orders the army to the border. I fear Trump has gone well beyond yelling Fire in a crowded theater. He’s chaining the doors closed, yelling Fire, and then blaming the trampled victims for not having brought bolt-cutters to the movies. …”“I am in favor of a dictatorship” and lamented the end of the country’s brutal military dictatorship in 1985. Has Trump’s got competition on vulgar, vile racist, mysogynist, homophobic, anti-environment, xenophobic, pro-fascist, far righty rhetoric? Guess he’ll have to try harder. Another like-minded Killer and Torturer. Dicktraitor today welcomed Bolsanaro on board the despot brigade + prolly sees dollars signs in Brazil. God bless teachers for being the underpaid and unrecognized heroes in our community. But they are also affected by this trauma and shouldn’t have to act as grief counselors, especially without training. The school should’ve been closed. It’s a failure by the superintendent. At 12, I was in 6th grade. Watching soap operas and game shows on TV, plotting to get my violin stolen, so I wouldn’t have to practice anymore and gossiping with my friends on the phone. What a bright future this young lady has ahead of her. The difference is this: in 1942 when they came my family to march us out of our home at gunpoint, almost no one stood up for us. Today, when something happens to any of us—Jew, trans, Muslim, migrant—many, many rise up. We can learn. We have learned. We must keep learning. I fell out. A couple of those tweet comments in that thread were truly funny! "Who am I to you?" Our founder @YaraShahidi asks in the light of the senseless tragedy all around us. We recognize that it's important to ask and spark conversations. We are eight days away from the biggest election of our lives. On November 6, we have the opportunity, as a generation, to ask the question, "Who are we?" Well, hope they did early voting. I feel it’s all connected to voter suppression. Why now? People were shot fleeing Russian Occupied Germany, but now a #PutinControlled @POTUS sends #USTroops to shoot at (BROWN) women, men & children seeking asylum in America. That's as UN-AMERICAN as it gets. #TrumpRussia. The military are being sent to the border w/ Mexico to safeguard against a small caravan of immigrants (who at 4,000 or so may be more than attended trump's inauguration, no wonder he's scared) but can't help residents who are victims of a real hurricane inside our border? Ugh.